The British soldier of the last few years of the 19th century - the period covered by this set - was dramatically different from one of a generation or two earlier. He wore a khaki drab uniform and used a quick-loading rifle to greatly increase his firepower, and he fought in many far flung outposts of the enormous empire. Each conflict taught the army useful lessons, but it was still ill prepared for the modern warfare it was to face when war with the Boers broke out in 1899. By now we are well used to seeing the all-different poses of a typical Strelets infantry set, and this is in many ways no different. The poses include a great many firing, including some that are prone, and others that are moving forward. As usual we have no marching pose, but in a change from previous output there is not one figure that is clearly engaged in hand-to-hand fighting. Not one figure swinging his rifle around his head or waving a knife around. This is a generally good thing, as most of the time the fire power of the infantry kept enemies at a distance, or else there were long-distance shooting duels when the enemy was also armed with rifles, but on some desperate occasions the soldier still had to defend himself from edged weapons. Once again we find an inappropriate flag in the set. The British banned the carrying of flags in the field in 1882, so the best thing to be done with this man is to remove the flag and leave him with his revolver. Several of the men firing are doing so while holding the rifle with their left hand virtually beside the trigger. This would be an impractical and inefficient stance, and looks very bad. It appears the Strelets desire to provide multiple firing poses has caused them to add too much variety - several almost identical firing poses would have been perfectly valid and reasonable. Several of the poses are lying on the ground, which is more suggestive of the open order battles with the well-armed Boers than the poorly-armed natives of the Sudan, for example. The man on his back reloading his rifle is really nice, and the pair of a man helping a wounded comrade is reminiscent of the old Esci pose. The set includes three officers with swords (one a scimitar!) - a weapon that is fine for most colonial wars but was quickly dropped during the Boer war as marking the owner out for special treatment by snipers. The men all wear the standard foreign-service uniform of the day, including the foreign-service helmet with puggaree. In the South African (Boer) War this was normally covered, but none here have such a cover, and none have a neck shield, which was a device much seen in north Africa and elsewhere but more rare in the south. A couple seem to wear field caps, but these are too poorly realised to identify. Most of the men have what looks like an approximation of the standard Slade-Wallace equipment, but in many cases this means only the front two ammunition pouches. A few have a haversack on the back, and in a very few instances there is also a canteen, yet we would have thought this last was a vital item in such hot climates and should be on most men. Some but not all have a bayonet scabbard, but none have a bayonet in it, so if it is not on the rifle then they are missing this item completely. Despite still retaining their swords, the officers have sensibly abandoned their Sam Brownes for OR webbing, which is something of a contradiction. Finally just two men have bandoliers instead of the Slade-Wallace, which was unusual for the infantry and suggests they might be either mounted infantry or dismounted cavalry. The general level of sculpting is fairly poor, and there are some particular areas where it dips below that standard. The detail is pretty chunky and sometimes less than adequate, but one of the areas that has particularly suffered is the prone firing poses. All these are done face on to the mould - always a tricky proposition - but here there are no facial details at all, and even the bare heads are far from round, with flat surfaces and corners - a feature that is particularly evident in the staggering wounded man. Many of the poses are quite flat, so for example the officer with what look like binoculars (row eight, last figure) is actually holding something with no depth at all, making them look like his spectacles! The shape of the helmet has not always been well done, and the crawling figure next to the man with the 'binoculars' has something entangled round his left arm which we could not identify or guess. 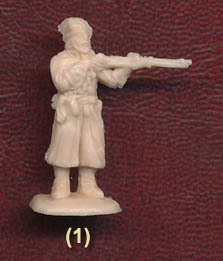 A constant problem for figure manufacturers is that troops usually change their appearance during the course of a war, and this was particularly true of the Boer war. Officers mostly abandoned their swords, Wolseley helmets and other identification and were largely dressed and armed like their men. The men soon found that the slouch hat was a much more practical alternative to the helmet, and this was increasingly worn, both officially and unofficially, as the war progressed until by the time later reinforcements were sent they were only given the slouch hat. Therefore we would suggest these figures, although something of a compromise between different colonial conflicts, are best suited for the early Boer War. This set is quite unimpressive, and has some odd design decisions which we have highlighted. With basic poor sculpting in simple areas such as bare human heads, this is not a good offering from Strelets who have done much better before. The absence of flash is a plus point, but there is much room for improvement.